@RZOffshoreGuy sheds some light on one of the great mysteries of the oilfield. Currently, it’s nearly impossible to open an industry publication and not find horizontal or directional drilling referenced. And for good reason. 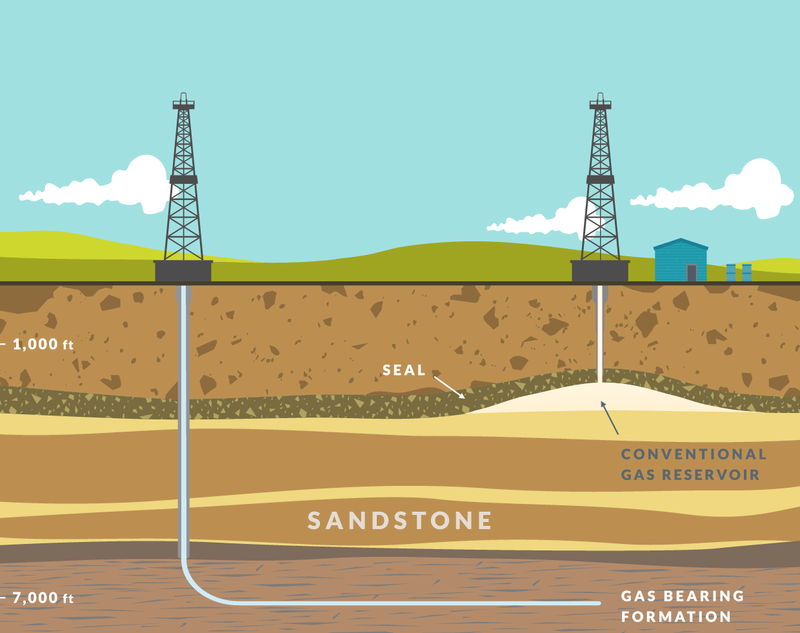 Those wells are arguable the main component that made the U.S. shale revolution possible. Fracking gets all the headlines as the technology that allowed the extraction of shale oil and gas but without the long laterals of horizontal wells there wouldn’t be enough exposed pay zone to frack in the first place. And, frankly, what’s more impressive? Being able to bust open some rock or accurately drill a 20,000-foot well 90 degrees from vertical? Settle down frac hands, I’m being sarcastic … sort of. We’ve known for a while about the large quantities of oil and gas trapped in shale plays like the Eagle Ford in Texas and Bakken in North Dakota. The problem is that the pore spaces in tight shale formations prevent economically attractive amounts of oil and gas from flowing freely into a conventional wellbore. Vertical wells only expose the portion of the shale formation that is directly below the bit. That’s fine if you’re drilling through several hundred feet of pay zone, but it is less than ideal if your target is only 20 feet thick. What if you could drill inside instead of through that formation? I’m not sure when I was first made aware of the terms directional or horizontal drilling but I have to assume it was in the early 90s when I was in high school. I remember having a vague understanding of what it was but absolutely zero understanding of how it was accomplished. If you’re reading this, you’re probably in the same position. About 10 years later, I laid eyes on my first directional bottomhole assembly and it all started to make sense. Directional drilling technology has evolved quite a bit and become very sophisticated over the years but the basic idea is still the same: orient the bit in the direction you want it to go. In the time I spent working offshore, every directional well I was involved with was drilled using mud motors. Without getting overly technical, a mud motor is a downhole tool similar in size to a drill collar and contains a positive displacement pump (PDP) that is powered by drilling fluid being pumped down the drill string. The PDP is used to rotate the bit independently of the drill string. Mud motors used in directional drilling are fabricated with a slight bend that can range up to about 4 degrees. The vertical portion of the well is drilled normally with the entire drill string rotating. When the operator decides they’re ready to go directional, drilling stops and the directional driller orients the drill string so that the bend in the mud motor points in the direction that everyone thinks the well should go. At that point, the PDP is engaged and only the bit rotates. As weight is applied, the bit begins to chew through the formation and the hole that’s made corresponds to the degree of bend built into the mud motor. When the appropriate hole angle is built, the PDP is dis-engaged and conventional drilling resumes on the new trajectory. This type of drilling is called “sliding” because the drill string is literally sliding along the well bore because the bit is the only thing that rotates. Sliding can be slow and creates a lot of drag which causes problems when you start drilling long horizontal wells. A lot of friction has to be overcome as gravity pulls the drill string to the bottom of the well bore. To combat this, the ingenious men and women of the oil and gas industry invented various Rotary Steerable Systems (RSS). RSS provides the advantage of controlling the direction of the bit while simultaneously rotating the drill string. I’m not going to get into the reasons why but just know that keeping the drill string rotating while you’re drilling helps keep a lot of downhole demons at bay. RSS centers around 2 different technologies known as push-the-bit and point-the-bit. Push-the-bit technology controls the path of the well by physically pushing the bit against the side of the well bore. This is done using a series of moveable metal pads built into a non-rotating portion of the downhole steering tool. The bit can be guided in any direction by pushing 1 or more of the pads against the opposite side of the well bore. When the pads aren’t busy guiding the bit, they act as stabilizers to keep the bit centered. Point-the-bit technology is a little more difficult to explain so you’re going to have to use your imagination. In point-the-bit systems, the bit is attached to a flexible shaft that extends through the tool body. Different companies go about this in slightly different ways but all involve the deflection of the shaft. One company uses a series of eccentric rings to deflect the shaft while another uses a set of pistons to push the shaft. Regardless of how it’s done, the end result is a bit that is always pointing at the targets that the geologists and petroleum engineers identified. As effective as point-the-bit and push-the-bit systems are, they’re useless without reliable electronics to control the downhole tools and reliable telemetry to know exactly where the bit is and what direction it’s going in at all times. The success of RSS is a result of years of effort across many different disciplines within the industry and allowed hundreds of thousands of feet of oil and gas-bearing shale to be exposed by extended reach horizontal wells. Which, in turn, allowed the fracking companies to swoop in and soak up all the attention. Well done frac hands! I left out a lot of details for the sake of time and maintaining interest level. If you’ve got questions on this or anything else oilfield-related, you can hit me up on Twitter @RZOffshoreGuy or leave a comment below. Also, Rigzone’s How it Works section may be able to answer some questions so give it a click. hey mate Great Explanation !!!!!! . but i still have a basic doubt . i would like to know as to why is directional drilling called directional ? & not deviated drilling ” as we are eventually deviating the well ” . What could be the technical reason behind this ? please explain Thanks. hiya anishnair, directional drilling moves sideways as well as up and down which makes it way easier to control. It a great solution to dig with minimal destruction to the surface. Great question! It’s always been my understanding that a deviated well is any well drilled off vertical without a specific direction requirement. Directional wells are drilled off vertical on a specific azimuth or many azimuths if you’re trying to hit several targets. A well is considered horizontal when it becomes more than 80 degrees off vertical. I hope this helps! Thanks RZOFFSHOREGuy . IT does help , But i would still like to know ” If deviated wells without specific direction are drilled these days OR is deviated drilling being replaced by directional drilling .? Thanks . Deviated drilling still has its place although it’s not very common. I’ve seen a deviated well drilled when an operator was fairly sure they had drilled into the high point of a very large accumulation. They set a whipstock to deflect the drill string but they weren’t concerned with hole trajectory, only that drilling resumed in another direction. Also, wells get deviated on accident when drillers don’t pay attention to drilling parameters. Too much weight on the bit can cause the drill string to flex which can send a hole way off course. Thanks mate for the explanation . what i understood here is ” the operator used the whipstock to simply deflect the well from the vertical & once deflected they just drilled to the desired depth without taking the direction of the well into consideration “. Am i right . You’ve got it. Also, what I should have said before about accidentally deviating a well is that different rules and regulations come into play depending on where you are in the world. I can’t remember the exact number but after a well goes several degrees off course it’s considered “deviated” and you’re required to have a directional driller on site (even if your plan is just to turn it back vertical to reach your initial target). I’m pretty sure you have to re-file your original drilling permit as a deviated well. Accidental deviation creates headaches for everyone and it makes the well much more expensive. Great article. Good explanation for us non oil guys. Great Info ! You should write a book ” Drilling for Dummies “. Great article. Sums up everything for a non-oil guy like me. There’s something of interest that I would like to know -slant drilling, also a non-conventional drilling technique. They said you would have to bypass a lake or something in order to get to the pay zone right beneath that lake. My question is, if you find a tight layer of sandstone beneath that lake, would you adapt directional drilling? Or would you re-adjust the angle of your “slant”? Interesting question. I’ve never been a part of a slant drilling operation so I don’t know much about it. To my understanding, slant wells are useful for drilling targets that are so shallow that a directional bottom hole assembly might not be able to build angle fast enough to reach. Modern directional tools build angle much faster and I believe they have made true slant drilling almost obsolete. Getting back to your question, to my knowledge, it’s entirely possible that an initial slant well could go directional to expose more pay zone. Several factors would have to come into play like economics, directional tool/driller availability, reservoir deliverability, etc. Slant drilling definitely isn’t my area of expertise but I hope this helps. Thanks RZ OFFSHORE GUY your explanations help a lot . slant drilling according to me is different from directional drilling . in case of slant drilling , the derrick of the drilling rig is slant & there is no kickoff point as we have in directional drilling , the drilling takes place at an already predetermined angle right from the surface & is drilled straight to the desired Total depth . correct me here if i am wrong . i would however like to know if slant drilling is used these days ? if yes , where exactly & for what applications . I think the main drawback to slant drilling is the fact that a specialized rig is required when there are so many conventional drilling rigs on the market. I did a quick search and ran across this OGJ article from 1992. Just glancing over it leads me to believe that the technique is fairly regional and is used to access only shallow formations. At this point, I haven’t run across any recent slant well being drilled but I’ll post here if I find any. Please do the same because I’m very curious about this now. sure , i read the blog . it says that slant drilling is much cheaper than directional drilling , so in such a case it must be widely used than directional drilling which is not the case . Is directional drilling another description for fracking ?